Solchany compares today’s relevance of F.A. Hayek to Wilhelm Röpke’s and shows that, unlike today, during the early decades of neoliberalism, Röpke was almost as important as Hayek in shaping nascent neoliberalism. 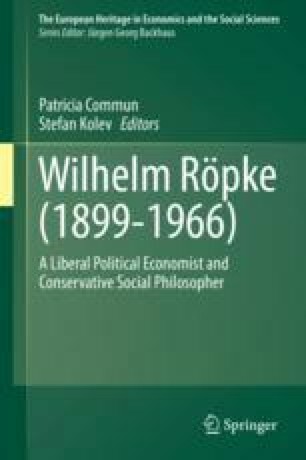 While Hayek contended at the end of The Constitution of Liberty that he is not a conservative, Röpke in A Humane Economy presented himself as an outspoken conservative. By analyzing Röpke’s worldview and showing its roots, Solchany emphasizes the conservative side of neoliberalism, an anti-modernist outlook not only shared by many European neoliberal intellectuals, especially in Germany and France, but also raising great interest among US conservatives. Röpke’s intellectual relationship with Russell Kirk was particularly important here. These US conservatives looked for an innovative creed to merge conservative and liberal values.